Flat out fact: Guys look hot in tuxes! Formal events and prom nights are their chance to shine too. Today more than ever, guys are interested in the latest tux styles, colors and options available to make them stand out from the crowd, be unique and look like your prince charming! As guys are not usually big on shopping they may need a little help from you to find their best look. There are so many style and accessory options to choose from it can be a bit overwhelming. . Tuxes in traditional, retro and contemporary cuts and colors. Ties of all colors and patterns in traditional bow, contemporary straight, windsor, four-in-hand or ascot. Cummerbund vs. vest. Collars in lay down, wing or mandarin. Jackets with two buttons or three…Lapels in shawl, peaked or notched. Pants in flat or pleated front. Buying or renting a tuxedo is really a budget decision. Some guys buy their tuxes if they are going to be wearing one more than once in the near future. A classic timeless tux of good quality, not one of those $99.00 throw away specials you see online, is the best option. Renting provides for more flexibility in style and color per occasion. Many stores run prom specials making this option especially affordable. The key is to find a good rental source with a good reputation and quality tailoring and go in early to reserve your tux style as the hottest new looks book out first. You can go back in and select your color options later if need be. 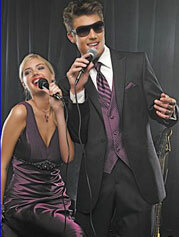 The first step in your guy choosing a tuxedo should be taking into consideration the style of your dress. Princess ruffles go nicely with a traditional tux. Sizzling hot contemporary dress… check out the contemporary longer tux jackets. Vintage dress…maybe a retro tux. Next consider the color or one of the colors of your dress for incorporating into his tux components for a perfectly paired look. This can be done with the color of the vest, tie, cummerbund, suspenders etc.. Stripes and patterns are great with a solid dress. Don´t forget the boutonnière color in the overall plan as well. And last but not least…make sure the tux is fitted and tailored correctly to be comfortable so your guy feels good, stays cool and looks hot! We´ve done some research to help you and your guy become the dazzling duo of your dreams. Check out Formal Wear Suppliers Links We Love and Tux Info Links We Love to find tons of great tips and info! Look to Jean Yves for some of this season´s hottest, fashion forward looks. Check out their website to see all the looks including the “Twilight” in black and white versions paired with or without colored vests and ties! The Miami based manufacturer designs and sells tuxes, jackets, shoes, and formal accessories exclusively to formal wear retailers either directly or through national distributors including Jim´s Formalwear and Paul Morrell. Jean Yves designs can be located through the Jean Yves on site retail store locator or through the Jim´s Formalwear affiliated on site store locator as well.